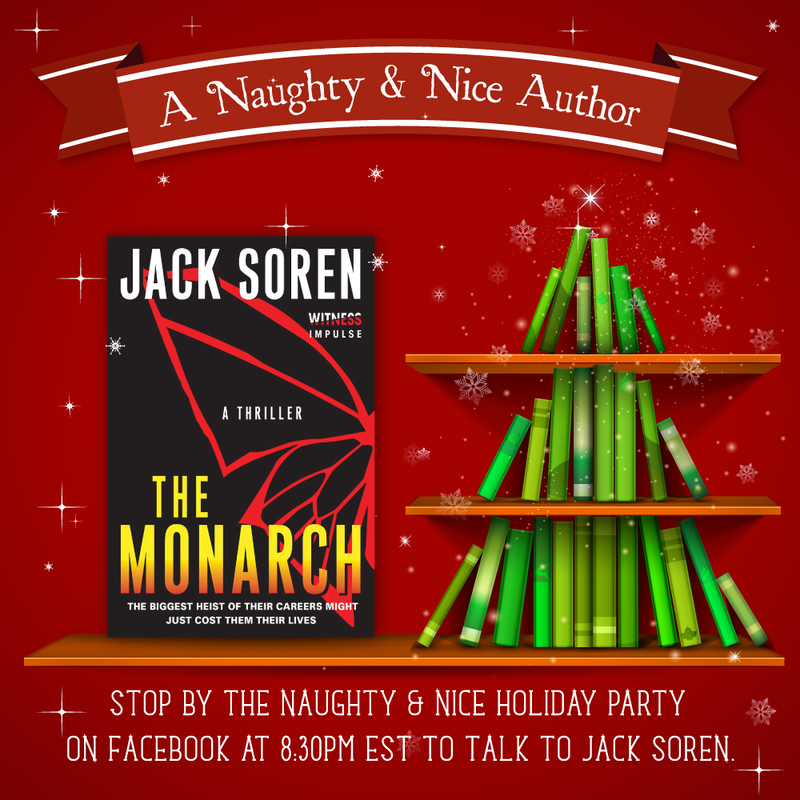 Naughty & Nice Facebook Party Tonight! Win free ebooks and signed bookmarks! Stop by tonight at 8:30 on facebook to say hello! There’ll be presents and wise-cracking…fa-la-la-la-la. I was featured this week on the NaNoWriMo blog. THE MONARCH was started during a NaNo a few years ago. For more details, check out the whole article. 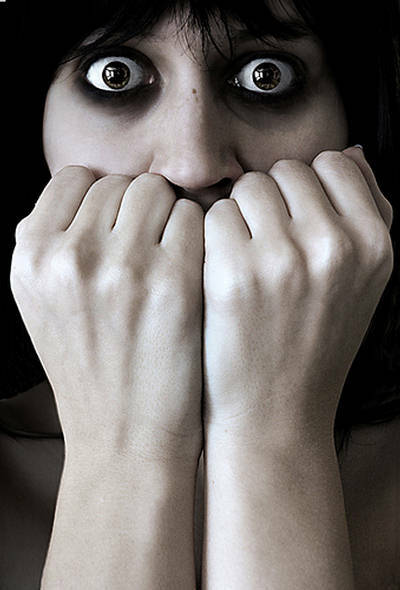 Is fear the most common emotion in thrillers? All this week I’m participating in an author roundtable discussion over on ITW’s Thriller Roundtable. The topic this week: “Is fear the most common emotion in thrillers?” Drop by and see what the minds that are trying to thrill you really think. And me, of course. And don’t forget that THE MONARCH debuted today! The ebook is currently available all over. The paperback comes out Jan. 6th, for all you wonderful luddites. (That would include me, of course.) But feel free to pre-order it. I won’t mind. Really. I mean it. 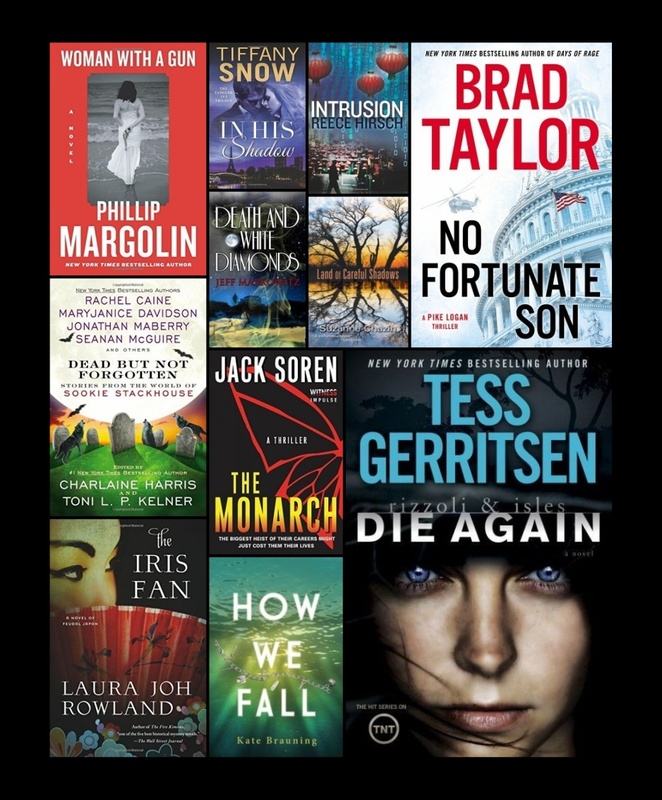 Win the December bookshelf of signed thrillers! December is here! I updated the Win Books page with some fantastic books. As always, there are NY Times bestsellers, favorite series, and debuts. Tess Gerritsen brings back her hugely popular Rizzoli & Isles in Die Again. Charlaine Harris hand picked a team of superb writers to dream up more tales for Sookie Stackhouse in Dead But Not Forgotten. Laura Joh Rowland takes us back to feudal Japan in her latest Sano Ichiro novel, The Iris Fan. Phillip Margolin stumbled across a haunting photograph in a breakfast eatery in Virginia which inspired his latest, Woman with a Gun. Brad Taylor continues his tremendously exciting Pike Logan series with No Fortunate Son. Land of Careful Shadows by the award winning author Suzanne Chazin introduces Jimmy Vega, a Latino homicide detective. Reece Hirsch brings us into the secretive world of Big Data inIntrusion. Jeff Markowitz wonders, “did you ever have one of those days,” in his latest, Death and White Diamonds. And Tiffany Snow brings us into an underground British agency in In His Shadow. I love finding new authors so it is with great pleasure I offer up two smashing debuts, The Monarch by Jack Soren, and How We Fall by Kate Brauning. If you are new to the site, each month I run a contest in conjunction with the International Thriller Writers group. We put together a list of books including bestsellers and debut authors, so you can win some of your favorites and find some new favorites. Don’t forget, if you subscribe to the newsletter or follow this blog, you get an extra entry into every contest you enter. I just updated my book tour dates for THE MONARCH. More will be coming, including signing locations and dates. Stay tuned. I’m working at getting THE MONARCH bookmarks printed and I’ll be offering signed bookmarks here and in a few other strategic locales. And a contest is in the offing!